A major fire gutted a building at the Schooner Cove apartment complex Monday afternoon, displacing 12 families from their homes. 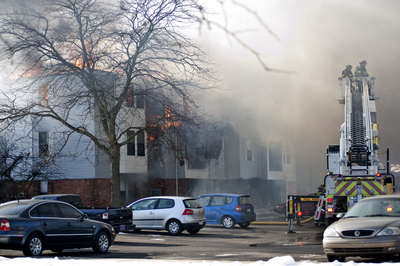 Firefighters were dispatched to the Ypsilanti Township apartment complex, off Huron River Drive near Tuttle Hill Road about 1 p.m. Monday. Ypsilanti Township Fire Chief Eric Copeland said the fire started in a second- or third-floor apartment at the front of the building. Witnesses told AnnArbor.com a grease fire in a second-floor apartment started the fire, but Copeland said it’s not clear at this point what started the blaze. “At this point, there is no determination,” Copeland said at 3 p.m. Monday. An investigator was on the way to the scene, he added. Firefighters from Ypsilanti Township, Ypsilanti, Ann Arbor, Pittsfield Township, Augusta Township and Superior Township battled the blaze for most of the early afternoon Monday. At 1:30 p.m., the smoke from the blaze was so thick it was impossible to see the parking lot where firefighters set up their command station. By 3 p.m., most of the blaze was extinguished and firefighters were working to knock down the remaining hot spots, Copeland said. No one was injured in the fire and all the residents were evacuated. The American Red Cross said in a statement at least 12 families were affected by the fire and food and water was being provided to first responders on site. Kelly Gorski, associate director of operations for McKinley, the company that owns the apartment complex, said all of the displaced residents had somewhere to stay Monday night thanks to the Red Cross. The company was also working with the residents to perhaps transfer them to other McKinley properties in the area. Leo LeBron lives on the first floor of the building and said he was shaken from a nap by a woman running through the building, knocking on apartment doors and alerting residents to the fire. Smoke billows from the burning building at Schooner Cove. LeBron wasn’t sure if his second cat made it through the fire but was hopeful. At one point, he actually rushed back into his apartment while firefighters worked to contain the swirling flames not far above his head. “I ran back inside to try and find her, because they’re not going to do anything until they break the door down,” he said. Most of the fire was contained to the top floors of the three-story, L-shaped building. Ann Arbor firefighter Jason Gravelle rescued two cats from two different apartments in the building’s second and third floors. Two dogs also escaped harm in the blaze, one of which was carried to a Huron Valley Ambulance vehicle by a firefighter. There were other pets unaccounted for as of 3 p.m. Monday. Approximately 40 firefighters were on scene, in addition to deputies from the Washtenaw County Sheriff’s Office and three units from Huron Valley Ambulance. Neighbors and residents stood in the January cold, watching the firefighters dodge falling pieces of roof and siding while they fought the flames. Water poured out of the crevices of the building as fire crews battled the blaze. Sean Elamon lives in the building immediately adjacent to the burning building 5086. He said he was keeping a close eye on the flames as they neared his building.